“Bermuda’s marine environment and its inhabitants are used to major storms, including hurricanes. 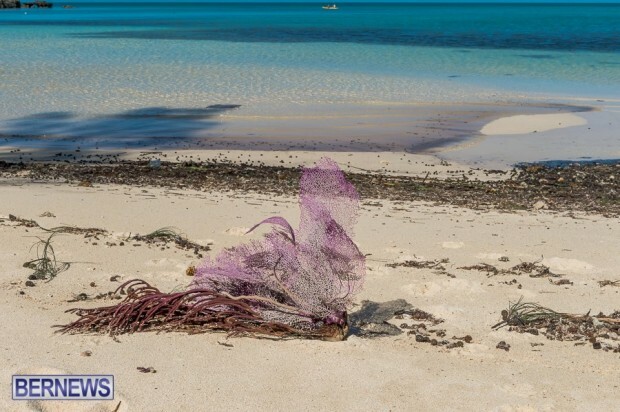 There will inevitably be some acute damage as well as some ongoing negative effects in the short to medium term, but overall our marine ecosystems tend to recover well,” the Department of Environmental Protection said. Having found both a sea fan and a dead fish on the beach after Hurricane Gonzalo, Bernews asked the Department of Environmental Protection what impact hurricanes have on our ocean life. A Department of Environmental Protection spokesperson explained that, “The strong winds associated with hurricanes generate large, powerful waves that can affect the ocean and the marine life that lives in it in many ways. These waves can also impact our island’s shoreline. “Soft corals such as sea fans and sea rods are attached to the reef by a small base, and strong waves can rip them off the reef surface. Therefore it is not uncommon to see seafans washed up on the beach after a severe storm. “Hard corals like brain coral are more firmly attached across a broader base and their shape allows the waves to wash over them, so they are less likely to break off. This is one of the reasons why they are the most abundant corals on Bermuda’s reefs. However the branching finger corals are more prone to breakage. “Mobile animals like fish generally swim to areas where they can find some shelter from the waves. This can mean finding a hole or cave, swimming inshore to protected bays or swimming down to deeper depths. However some types of fish do not swim very fast and are unable to cover the distances required to find effective shelter, and they are therefore more vulnerable during storms. “Unfortunately, mangrove trees, which grow along the shoreline, reduce erosion and provide valuable habitat for birds and young fish, are particularly vulnerable to storm waves, and are often badly damaged during hurricanes. “In the shallow waters around the island, the waves stir up the sand on the bottom, mixing it into the water. This has several impacts. The sand in the water blocks light, meaning that plants and the microscopic algae that are symbiotic with most shallow water corals cannot photosynthesise and thus end up with a nutritional deficit until the water clears. “The suspended sand can also clog the gills of fish and the feeding apparatus of animals such as mussels that feed by filtering microscopic plankton from the water. Lastly, when the sand settles back down to the bottom, it can land on the surface of corals and other marine life that lives attached to the bottom. “Hard corals that do not move with the water flow must then use their tentacles to push the sand away, and this requires energy. The effects of suspended sand generally don’t kill marine life but, by negatively impacting feeding or energy reserves, can lead to reduced growth and/or reproduction over the following year. “In the open ocean, water movement mixes warmer surface waters with cooler deeper waters, leading to a noticeable drop in water temperature in all areas that the hurricane has passed through. Swimming after Gonzalo feels more like swimming in January than October! “In addition to being cooler, deeper waters also contain nutrients and so the mixing can lead to a burst of productivity in oceanic waters. In contrast to the impacts associated with suspended sand in shallow areas, the potential for increased productivity in ocean waters means that there are often greater than average catches of fish like tuna and wahoo in the year following a major hurricane. “All that said, Bermuda’s marine environment and its inhabitants are used to major storms, including hurricanes. There will inevitably be some acute damage as well as some ongoing negative effects in the short to medium term, but overall our marine ecosystems tend to recover well. 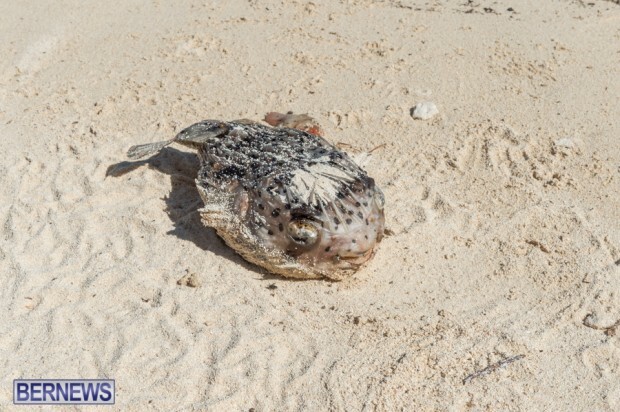 “This may be partly attributed to the suite of hardy species that live here, but is also related to the general good health of our coral reef ecosystems which allows them to better tolerate disturbances,” concluded the Department of Environmental Protection. For all our coverage of Hurricane Gonzalo click here, for our live blog on the aftermath of Hurricane Gonzalo click here, and for additional coverage on the impact of Gonzalo on our environment click here. What does this all mean for the Lionfish being that they are not from our region?